PCSP Library Has Gone to the Dogs! PORTUGAL COVE-ST.PHILIP’S – There will be some barking good times happening in the newly renovated PCSP Library this fall. In partnership with St. John Ambulance, the Town will be hosting the “Paws 4 Stories” program. 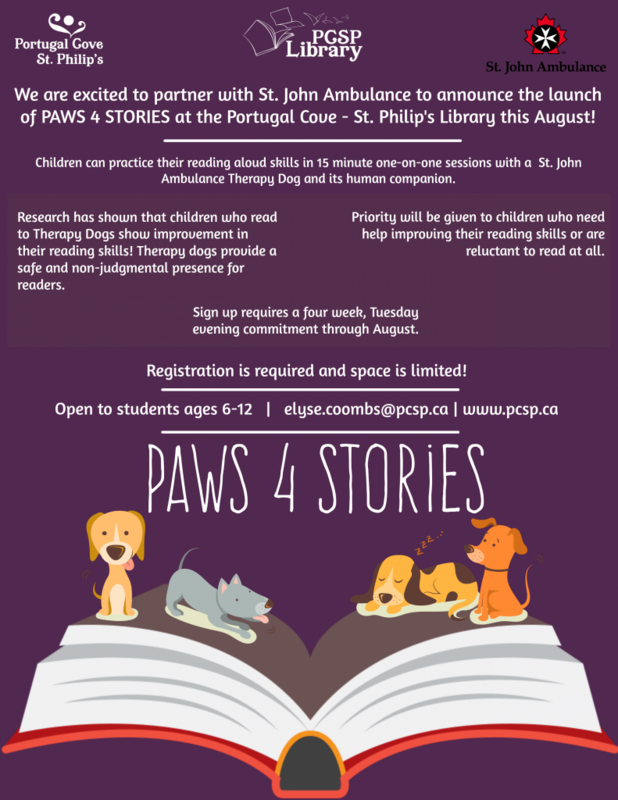 The Paws 4 Stories program is a Canadian program developed by the St. John Ambulance Therapy Dog Program in conjunction with Canadian libraries, where children get the opportunity to read to a volunteer Therapy Dog. Children will get to practice their reading aloud skills in 15 minute, one-one sessions with a St. John Ambulance Therapy Dog handler team. This is the first time the Paws 4 Stories program has being offered in Newfoundland and Labrador. “Some children can be very shy or nervous to read aloud, or are reluctant to pick up a book at all,” says the new PCSP librarian, Elyse Coombs. “Adding the Therapy Dogs to the activity gives children an opportunity practice their skills with a non-judgmental and calming audience.” Research has shown that children who read to Therapy Dogs show improvement in their reading skills, as they feel more comfortable around dogs. Signup for the program will require a four week evening commitment from children and their parents/guardians. Registration is required and space is limited. It is open to school age students up to grade 6. Preference will be given to children who are struggling with reading or reluctant to read. For more information on registration, please call Elyse Sparkes-Coombs, at 895-5655 or email [email protected].